The ladybird was swimming desperately as I scooped it out, feeling that little rush of warmth at having rescued the tiny creature from a watery death. It wasn’t happy, but I placed it on the side of the sink to dry out while I soaked. I would take it outside when I was clad in something more decorous than a towel. From my supine position in the steam, I could see it begin to move, flexing its legs and shifting on the slippery surface; a tiny splash of colour against the porcelain. I like ladybirds. As a child they always fascinated me and I was almost offended when I read that they could bite. Surely… they wouldn’t? 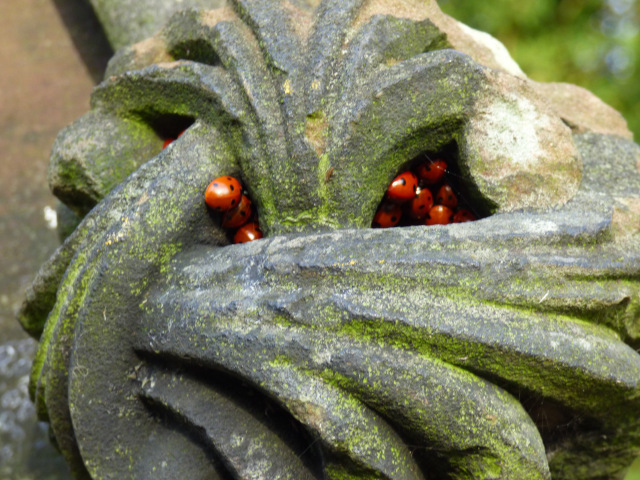 They are called ladybirds, apparently, for the Virgin Mary, who was often shown cloaked in red in the early paintings. The seven spots of one of the commonest types were said to symbolise her joys and her sorrows. 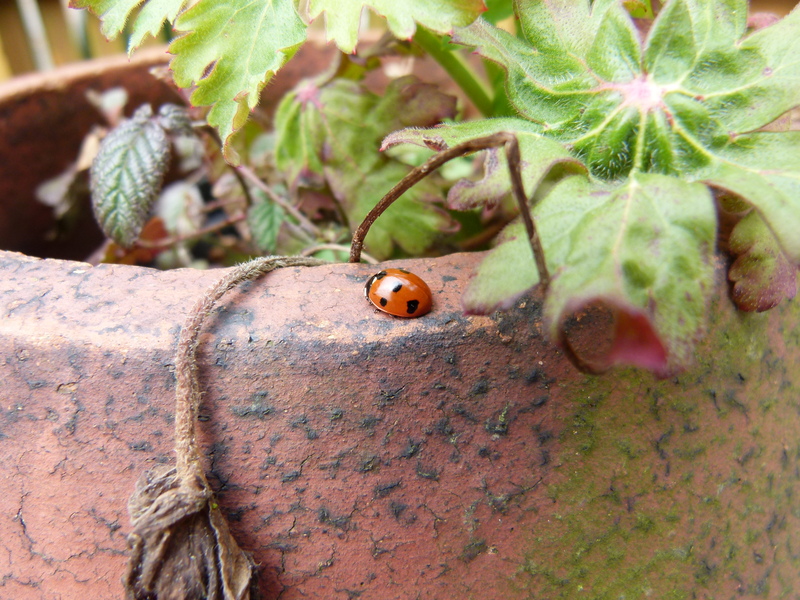 There is an older association, with the Norse goddess, Freya too; it is said the ladybird came to earth riding a bolt of lightning There is a lot of old lore about them… as predictors of weather, for instance. It would rain if one fell into your hand. It is true they do not fly when the world is chilled. This one, however, was recovering nicely in the warmth of the bathroom. As I dried and dressed I thought that perhaps I would only need to open the window for it shortly for it to ‘fly away home’… I watched it flex the fragile wings, glad to see it unfurl them. A short flight and it landed in the bowl of the sink as I was running the tap… and slid straight down the plughole, carried by the force of water into oblivion. There was nothing I could do, the little creature was gone. I waited a while, hoping to see it re-emerge in the manner of the spiders that hide there when threatened. Nothing. There would be no happy ending for this harbinger of good fortune. I was, I admit, quite upset by the incident, having saved it from drowning just minutes before, only to have assisted its passing with the running water. I couldn’t help but think about it though. It is said in many cultures that the number of our days is predetermined. 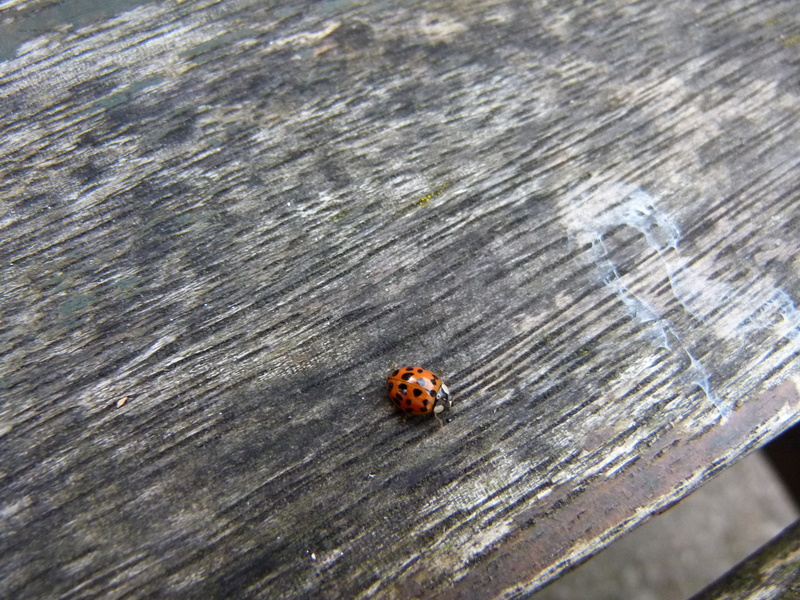 If it was the ladybird’s time, then perhaps there really was nothing I could have done. Perhaps it only mattered that I had cared enough to try. I am not a believer in strict predestination, though I do subscribe to the belief that we choose the broader outlines of our lives in order to provide us with the opportunities we need that we may learn and grow; a vessel into which the wine of life is poured. I am a firm believer in the gift of free will and the ability to shape our lives and futures within a greater Perfection. I do, however, feel that there is ‘a season and a time to every purpose’. There is an intuitive understanding of when the time is ‘right’ that most of us feel; a tide of possibility that ebbs and flows with the seasons of our lives, and while some things carry an air of obstinate inevitability, others open before us as new landscapes full of adventure. At these moments we have a choice, whether we retreat to safe familiarity, or move forwards, through the open door into the unknown. At such times we cannot know whether a dragon or a pot of gold awaits us, only whether or not we have the courage to find out. Yet there are other times when we know we simply need to be still, to find an oasis of calm within ourselves, away from the hustle and bustle of a world that moves too fast around us. A place to breathe and simply be… right here, right now. And then there are the times when events move beyond our control and we can do nothing to change them. Yet even here we do have choices… we can ride that ever-flowing wave of time and tide and face inevitability in a manner of our choosing. And we can choose to learn and grow, even from the smallest event. In this way even the seeming vagaries of fate are at the mercy of a reality altered by will. When the ladybird goes down the plug hole, in spite of all your efforts, you have a choice… will you simply shrug and move on, grieve and salute the passing of a life, however small… and will you have learned to ensure that the plug is secure next time? Not sure if all of you have Ladybirds where you live but as a child I thought they were very special as they had a song named after them.. but be careful when you pick them up.. they are quite defensive! A beautiful and touching post… I would have been devastated too! Feels daft.. but it shouldn’t. No one life is worth more than another.. they are just more or less close to us and affect us differently. Unfortunately, for most of the time, I seem to make it up as I go along – which is not always the best strategy, for the long term. I did not know Ladybirds bite and don’t fly. I learn something new every day. Sorry it meant it’s end so unexpectedly. I think it is when the temperature falls below 55 that they don’t fly… not something I knew either! We once had a enormous number of these beetles decided to sit on the side of our house and painted it orange! You can get any you find to overwinter in a aerated jar with pieces of apple for moisture and food. PS one of my favorite Bible verses – it is soothing. Sad, but maybe the ladybird made a choice. It could have flown in any direction one it unfurled it’s wings and chose that one.It’s a shame you were chosen to be the means of it’s demise though. Perhaps that was also a purpose, to see if a human would feel the loss of one so small. John Donne said No man is an Island. I wish it were true but certainly some people are touched by the loss of any creature.whereas others are prepared to take that life. Sensitive and lovely thoughts, Sue. All life is precious and glad you see it that way, tender soul you! This time of year scads of ladybirds line our windows desperately trying to get outside. While many folk simply vacuum them up without a care, I scoop them into a container to release outside. They are garden allies after all! Theye are.. far better… and cuter.. than pesticides! You’ve made me think. I’m with you, all lives are lives. Fate, I’m still wondering about. By preference I’d like to think that we have some saying on what happens in our own lives, but if we consider LIFE at large, I think we’re just visitors and not very important at all. But it would be better if we tried to leave something good behind, rather than bad. Life itself is an indefinable quality… perhaps, like air, there is only one and we are all scattered fragments of it, like the colours refracted by a prism. Fate… as I said, I don’t believe in predestination, but I do believe that we ourselves choose the circumstances of it. Free will? Oh yes, I believe in that… a grace, perhaps (though that opens a whole theological debate… we’d probably need a bottle of wine…), but certainly that our own actions, reactions and choices shape our world and ourselves. 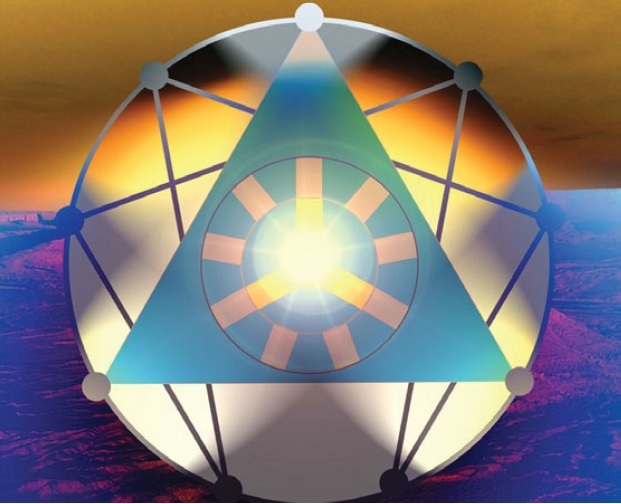 Yet how important is that in the greater scheme of manifest reality? We are such small creatures after all when set against the backdrop of creation.